This luxurious, lathering soap contains the deep cleaning properties that are inherent in mineral-rich Dead Sea mud. It delicately scrubs away dirt and environmental pollutants trapped in oily complexions and removes all residual skin secretions. This detoxifying soap can be used on the face or body. Lather up liberally and rinse off. I purchased in August 2018 and am just now buying a replacement. I use this on my face, twice a day (if I remember to wash at night). I have combination skin and tend to get hormone related breakouts. My skin has completely stabilized since I started using this. No afternoon shiny face, no dry spots, just even, nice, healthy looking skin. I do not use moisturizer, but do use a combination of Abnormal Beauty Company's serums along with this. Highly recommend. My mother-in-law has been buying this soap for me for years, & I love it so much; it really keeps my skin clear & looking & feeling healthy. So I decided to give it to my best friend one year for Christmas; now she requests it & expects it every year! Then she got married, & her (awesome) husband starting using it too, so I buy it for him as well. We all love this soap. I'm hesitant to give it to others now; I'll go broke buying soap! Great product with decent price. I've tested with litmus test paper and it showed neutral test result. Deep cleaning. My skin feels soft and clarified after using every night.Healthy ingredients. I'm planning to stay with it for at least a couple of years. I am 40 years old with combination skin. I have been using this, in combination with the Ahava Essential Moisture for combination skin, for about a month and my skin looks and feels great! It's really gentle yet cleans amazing well without drying out my skin at all! I'll never switch again! I am a 39 year old woman who suffers with persistent breakouts, that was until I started using AHAVA. I have tried several products that caused my skin to become irritated and despite their harshness my skin continued to breakout. 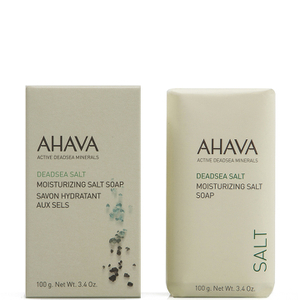 It wasn't until I started to use AHAVA that my skin is now clear and soft to the touch. I love this product and I just purchased a years supply. Ahava soap is the best hands down. I usually believe that gels or creams in the shower work better, but this is not the case here. You will not believe how smooth u will feel. Also try their body lotion and the salt soap bar. They all smell great too.